Alferius was born in 930 into the Pappacarboni family which descended from the ancient princes of Lombardy. In the year 1002, at the age of seventy-two, Alferius was sent to France by Guaimaro the Duke of Salerno as an ambassador to the court of King Henry II. Falling gravely ill on the way, before crossing the Alps, he took refuge in the monastery of San Michele della Chiusa. While the rest of the delegation continued on their journey, Alferius remained behind in the care of the monks and vowed to enter religious life should he be cured. 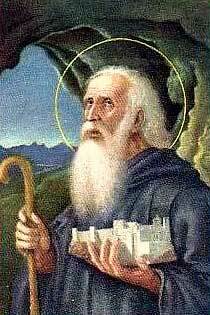 Upon recovering, he joined the Abbey of Cluny under the great St. Odilo. A few years later, he was recalled by Duke Guaimaro who wished Alferius to reform the monasteries of his own principality. Feeling himself unprepared for the task, Alferius retired to a secluded location in the mountains northwest of Salerno. There, after a while, many sought to join him but initially he only accepted twelve disciples. From this first nucleus developed the famous Abbey of La Trinità della Cava, which became the principal center of monastic reform of its time. It was modeled on the Abbey of Cluny and the Duke of Salerno became its greatest patron and benefactor. Alferius is said to have lived to the great age of 120. Just a few years after his death there were in southern Italy and Sicily 30 abbeys dependent on the Abbey of La Trinità della Cava and 3000 monks. The first four abbots are canonized saints and eight of their immediate successors are beatified. One of the Saint’s disciples was Desiderius, who became Blessed Pope Victor III.